There's nothing better than a holiday in the snow. Click here to play! Now you can enjoy all the excitement of those white mountains without the freezing weather and expensive accommodation! 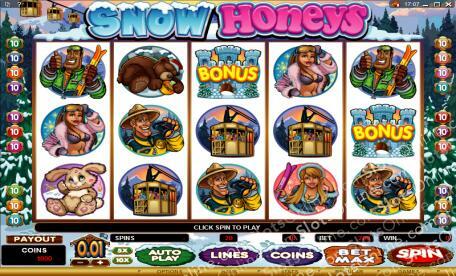 Snow Honeys is a dazzling 5-reel slot played across 20 pay lines. There are two unique Scatter symbols in the game: Ice Castles and Ski Resorts. These can appear anywhere on the reels, and if you spin up three or more Ski Resorts you will trigger the Free Spins feature. Three or more Ice Castles will activate the lucrative Hide & Seek Bonus Round. Once inside, you can throw snowballs at your friends for random bonus amounts! The Scatters are all lucrative symbols as well, but if you manage to spin up all five Snow Honeys logos you will be in for up to 4000 times your original bet! Join the Snow Honeys in their snowy adventure today for your chance to take home some incredible cash jackpots. The Ice Castles and Ski Resort symbols are both Scattered and pay out extremely well. If you spin up three Ski Resorts, you will trigger the free spins feature, and three Ice Castles will activate the Bonus Game. The Bonus game is activated when you spin up three or more Ice Castle symbols. Once inside, you can throw snowballs at friends for cash payouts.